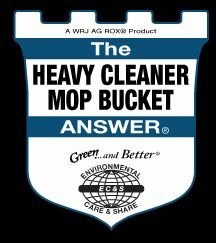 The Heavy Cleaner - Mop Bucket Answer® - Developed for environments that require the most powerful cleaning agents without any of the dangers that are typically associated with such products! Can be used straight from the bottle for the TOUGHEST of cleaning jobs or dilute as directed for the best sq. ft. cleaning coverage in the industry! Note: Mop Bucket not included. The greatly decreased hydrogen ion concentration (high pH) and balanced ORP (oxidation/reduction potential – measured in milli-volts) of The Heavy Cleaner-Mop Bucket Answer® provides the necessary molecular energy for the maximum emulsifying and chelating action that is required to remove the oils, greases, protein, other substrate and invisible substances to which dirt, bacteria, fungus and algae adhere, and to remove carbon deposits and breaks down calcium and other scaling substances. The Heavy Cleaner-Mop Bucket Answer® excels in commercial, industrial and agricultural arenas. A safe and effective alternative for those currently using toxic chemical cleaners. This advanced biodegradable non-toxic formula lifts and then traps dirt and grease molecules for easy removal.